Neyriz Steel Complex at the time of commissioning. 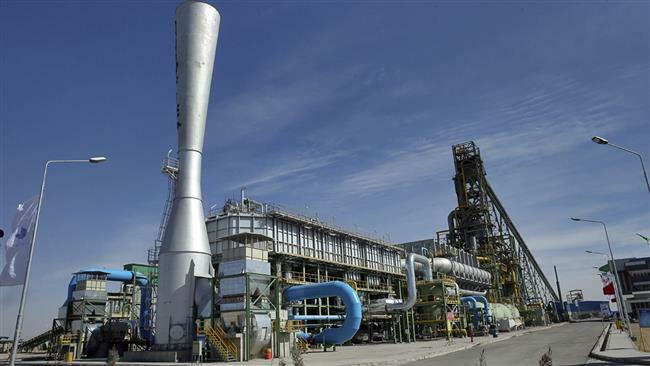 Iran has brought online its third steel plant which uses domestic technology for production of direct reduced iron (DRI) or sponge iron. The hot commissioning of Neyriz Steel Complex in the southern Fars province took place Saturday during a ceremony attended by state mines and metals holding company IMIDRO chairman Mehdi Karbasian. The DRI module has a capacity to produce 800,000 tonnes of sponge iron a year, raising Iran’s nominal capacity to 19.5 million tonnes, he said. “This is the country’s third sponge iron project using the domestic Iranian DR technology, PERED,” Karbasian said, adding it had been built with 65 percent partnership of the Ghadir Investment Group against 35 percent by IMIDRO. Officials tour Neyriz Steel Complex during its inauguration on Jan. 27, 2018. PERED or Persian Reduction has been invented and patented by Mines and Metals Engineering, an Iranian engineering company registered in Germany. The technology involves a direct reduction process converting iron oxides, in the form of pellets or lump ore, to highly reduced product suitable for steel making. Iran opened another DRI module with a capacity of 800,000 tonnes per year in the northwestern city of Miyaneh in August 2017. The complex is the first part of a three-tier development plan which also includes melting and rolling, with the reduction unit developed by Khatam-al Anbiya Construction Headquarters. Shadegan Steel established Iran’s first sponge iron module using PERED last May, also with a capacity to produce 800,000 tonnes per year. The plant in southwest Iran could meet some of Iraq’s crude steel demand, Karbasian was quoted as saying at the time of its inauguration. Neyriz Steel is building another plant with the participation and financing of Italy’s Danieli, its managing director Alireza Zahedian said Saturday. President Hassan Rouhani will travel to Kerman on Monday to open a 2.5 million tonne/year concentrate line and a 1.6 million tonne/year sponge iron module at Golgohar Steel, Karbasian said. Steel is a strategic commodity for Iran, home to the Middle East’s biggest automotive industry. The country also has a massive oil and gas industry and a sprawling transportation and water supply network with a mammoth construction sector. Karbasian said on Saturday that demand for steel in the country is currently flat due to a stagnation in its real estate market. Nevertheless, Iran is the world’s 14th biggest steel producer with 17 million tonnes, which is about to rise to 20 million tonnes. Karbasian also reiterated the country’s target to hit an output plateau of 55 million tonnes per year by 2025. Iran’s steel exports are expected to hit 8 million tonnes by March, having already exported 6 million tonnes since the start of the Persian year, he added.